Silverstone – Freies Training & Qualifikationstraining 1. Wetterbedingungen: Vormittags bewölkt, nachmittags sonnig. Das BMW Motorrad GoldBet SBK Team hat am heutigen Freitag intensiv an der Vorbereitung auf die Rennen am Sonntag in Silverstone gearbeitet. Auf der britischen Rennstrecke wird die neunte Runde der FIM Superbike-Weltmeisterschaft 2013 ausgetragen. Das Team und die Werksfahrer Marco Melandri (ITA) und Chaz Davies (GBR) konnten das Wochenende bei trockenen Bedingungen beginnen. Marco belegte mit seiner BMW S 1000 RR im ersten Qualifikationstraining den achten Rang, Chaz wurde Zwölfter. Im FIM Superstock 1000 Cup sicherte sich Sylvain Barrier (FRA) vom BMW Motorrad GoldBet STK Team die provisorische Poleposition. Er fuhr mit seiner BMW HP4 im heutigen Qualifikationstraining die Bestzeit. Sein Teamkollege Greg Gildenhuys (RSA) belegte Rang 17. „Nach dem, was in Moskau passiert ist, ist es für uns Fahrer das Beste, wieder raus auf die Strecke zu gehen. Heute Abend gibt es ein Treffen mit allen Fahrern und dem Veranstalter. Dort wird entschieden, ob wir uns künftig regelmäßig treffen und unsere Gedanken und Eindrücke zum Thema Sicherheit auszutauschen. Das wäre sehr wichtig. Jonathan Rea and Leon Haslam took provisional fourth and fifth places respectively in this afternoon’s opening qualifying session for round nine of the 2013 World Superbike championship at Silverstone in the UK. The British duo returned from the Suzuka 8-hours race in Japan earlier this week but took no time in adjusting back to their SBK-specification Honda CBR1000RR Fireblades at the 5.902km Silverstone circuit, ending the day separated by just four thousandths of a second. After grey and overcast conditions this morning, the first 45-minute qualifying session was run in warm, sunny but breezy conditions in which Tom Sykes took provisional pole position. We made some good progress straight away and got up to speed early on this morning, so I was really happy. This afternoon we went backwards with the set-up a little bit and we need to revert back to the ride heights that we had earlier. The bike was a little harder to ride, especially in the twisty sections. Looking at everything though, it’s useful to have Leon up there as well because we can learn some things from his data. We’ll sit down and go through it all tonight and learn what we can. It seems we’re faster than last year but in the second session it was quite difficult to do the lap time. We’ll try to make the bike more easy and try tomorrow with some improvements. Engine braking is still a bit of an issue and I feel like I’m being pushed into the corner a little bit, so we need to look at deceleration and then we should be in the ball park. But it’s not bad for a first day! We’re making progress, even though we have a few issues that we need to resolve, but, all in all, it’s good. It’s always nice to be a little bit higher up the time sheets and, although I’m happy enough with the progress we’ve made so far, we’ve still got a bit of a way to go. The leg injury is not holding me back as much here as it has at earlier rounds, and once we’ve solved these issues we can hopefully make some bigger steps tomorrow. This morning, Leon was struggling a little and didn’t do a lot of laps so we had to make the bike a little more to his liking. This afternoon he improved a little for a pretty good lap time, so it’s good to see him back near the front and showing his potential. Jonathan started pretty well this morning but we tried some things this afternoon, some of which improved the bike, some of which didn’t. We’ll analyse everything and try to make a better bike for tomorrow. 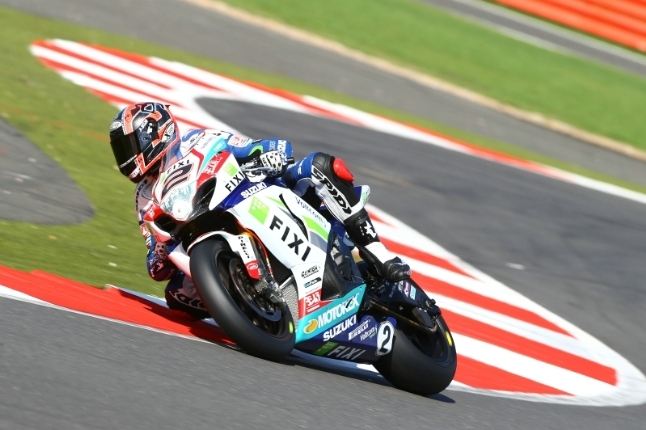 FIXI Crescent Suzuki’s Leon Camier began his birthday celebrations early as he set the second fastest time during first qualifying at today’s eni FIM Superbike World Championship event at Silverstone in England. Camier celebrates his 27th birthday on Sunday and started the weekend off in good style by setting the second quickest time in this morning’s free practice session around the 5,902m English circuit, a feat he followed up this afternoon to give him a provisional front row start for Sunday’s two races. 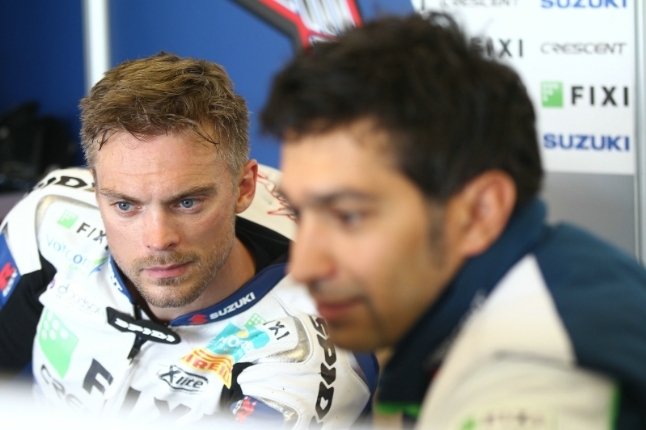 Camier looked impressive all day on his Yoshimura-powered Suzuki GSX-R and believes that with a few small improvements he will be able to push all the way on race-day. Jules Cluzel made significant steps between today’s two sessions that saw him shave almost a-second-and-a-half off his morning practice time during this afternoon’s qualifying. 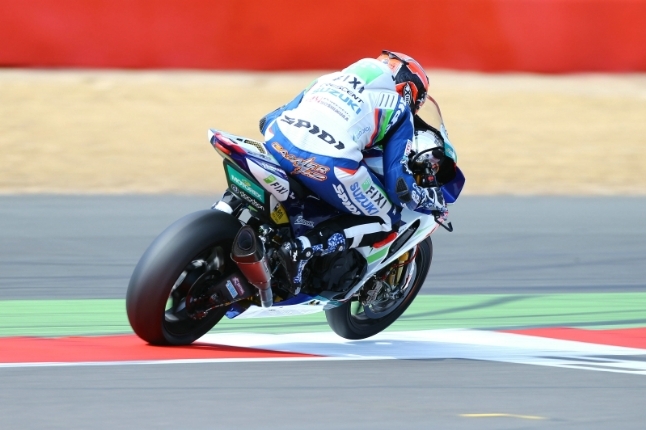 The Frenchman is making his first appearance at the fast and complicated Silverstone circuit on a Superbike and used this morning’s session to re-assess his braking points and lines before pushing for a faster time later in the day. Cluzel claimed the 10th quickest time in qualifying, but admitted that a mistake on what looked like being his best lap cost him dearly and stopped him from being much higher on the time-sheets. Today’s activities were held in changing conditions with the occasional hint of rain, which fortunately never materialised. Tom Sykes on a Kawasaki led the way by securing the top spot in both the practice and qualifying sessions. FIXI Crescent Suzuki will have a further 45-minutes of qualifying tomorrow morning to finalise the riders that progress to the afternoon’s Superpole. This will see the top-15 battle it out for the best grid positions for Sunday’s races. “It’s been quite a difficult day, because this morning I didn’t have quite a good feeling on the bike. We ran the same tyres for the whole session, so I was expecting some improvement this afternoon and with a new set of the same compound tyres I was immediately one-second quicker, which was quite good. On my last run I used a different compound and at the end I improved by another four-tenths-of-a-second, but I made a big mistake in the last split where I lost three or four-tenths and if that hadn’t happened I could have been second or third, so I think we are doing quite well and I’m looking forward to tomorrow. “Considering that both riders think there are big steps to take forward with chassis balance and overall performance of the GSX-R1000s from the first day here at Silverstone, the result looks pretty positive and promising for the rest of the weekend, especially if we can find the improvements they are looking for. 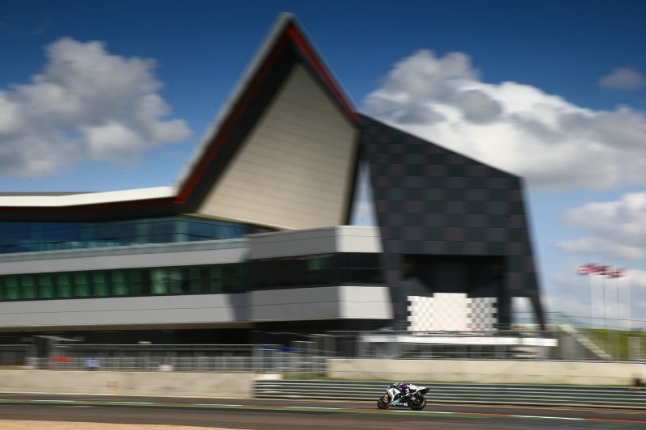 Silverstone is an incredibly challenging track, with a mix of high corner speeds and demanding requirements for the bike and rider over the course of a lap. It’s tough to find the perfect balance, but the boys will be doing the best they can to do just that.